When we talk about the cost of textbooks at Oregon’s community colleges, how much money are we really talking about? In 2015 and 2017, Open Oregon Educational Resources gathered locally relevant cost data that could be compared across institutions. Over two years, estimated costs have fallen as textbook affordability initiatives in Oregon’s colleges have grown. Lowering textbook costs allows students to redirect funds to help pay for additional courses or living expenses such as food, housing, transportation or childcare. Prominently designating no-cost and low-cost courses in the schedule enables students to make informed choices as they plan their term. Administrative support for textbook affordability programs can mitigate the impact of tuition increases on student costs. The results below show that statewide, average materials costs have fallen over the past two years for each of the three degree pathways included in the study. Where no-cost and low-cost course materials information is available in the course schedule, the lowest-cost degree pathway offers an extraordinary potential savings of 75% over the 2017 average materials cost. Statewide, Oregon is well below the national benchmark published by the College Board. The average materials cost for transfer degrees studied is 16% lower than in 2015. The 3,464 students who completed Associate of Arts Oregon Transfer (AAOT) degrees in 2017 each saved ~$332.58 from 2015 course material costs, a total of over $1 million. The 116,468 students in the highest-enrolled 10 courses statewide saved almost $2 million from 2015 average materials costs. The lowest-cost pathway through the AAOT degree requirements averages $461.48 in course material costs for a two-year degree. The number of hours at minimum wage it would take to cover materials costs has fallen by ~25% across all three degrees because of lower prices and higher wages. The cost of course materials as a percentage of in-state tuition per credit has also dropped, despite tuition increases at most colleges. Oregon’s community colleges are doing high-profile work to reduce costs for students. We are already having a significant impact on the cost of college; in the coming biennium we can stay on track and continue lowering costs, especially for high-enrollment courses. Read the full report. Open Oregon Educational Resources showcases textbook affordability efforts in Oregon and statewide initiatives in support of this important work, such as grants, training, and sharing open educational resources. Two years ago, Open Oregon Educational Resources conducted a study to gather baseline data on the cost of textbooks for transfer degrees at Oregon’s community colleges. Why do we need this research? provides context for the first study and the followup presented here. What is the cost of course materials for a transfer degree at each community college in Oregon? provides a detailed writeup on the method and results of the first round of research. The present study investigates the difference between the cost data collected in 2015 and 2017. In addition, now that most Oregon colleges have implemented no-cost and low-cost course material designations in the schedule as a result of HB 2871, it is also possible to determine the lowest possible materials cost while meeting degree requirements. The first study found that the College Board’s national average cost for course materials was a little bit above the average for Oregon’s community college transfer degree students. As an informal target, Open Oregon Educational Resources set a goal of reducing overall costs at Oregon’s community colleges by 10% over two years, when the study would be repeated. According to the College Board’s Average Estimated Undergraduate Budgets, 2017-18, students at public two-year colleges should budget $1,420 for books and supplies. This estimate, which has increased each year, suggests that for a two-year degree students would budget $2,840. Oregon’s colleges are now well below the College Board benchmark and have lowered costs by an estimated 16% versus 2015, while the schedule designation makes it possible to identify very low-cost degree pathways that represent an extraordinary 75% savings on course materials for students. This project, in 2015 and 2017, would not have been possible without the assistance of all 17 of Oregon’s community college bookstore managers. Each bookstore manager double-checked the data presented below to ensure the accuracy of the information collected for their colleges. Collaborating with the bookstore managers made very clear the extent to which campus bookstores are on the front lines of affordability, yet also vulnerable to the changes sweeping the industry. Bookstore managers negotiate with publishers to secure the best possible deal on materials, but there is only so much that they can do to control costs because they don’t choose the books in the first place. At the same time, according to student spending data provided by the National Association of College Stores, average student spending has decreased over the last decade, which affects the bottom line for stores. In previous years, student spending decreased even as textbook prices increased. In a 2015 article, About the Diverging Textbook Prices and Student Expenditures, Phil Hill writes that many students choose not to acquire course materials for a variety of reasons. They might borrow, share, pirate, or do without the materials altogether. In 2015-16, though, based on textbook price data provided by the National Association of College Stores, it seems that lower student spending may be in part a result of lower new and used textbook prices. With students saving money through use of open educational resources, comparison shopping, rentals, and other cost-cutting strategies, not to mention more competitive pricing from publishers, bookstore revenue is taking a hit. Some managers find themselves on the receiving end of advocacy for lower textbook prices, on the one hand, and pressure to maintain revenue to support the general fund on the other hand. A 2016 Student PIRGs report, Covering the Cost: Why We Can No Longer Afford to Ignore High Textbook Prices, concludes that community college students are more likely to use financial aid to pay for textbooks, in addition to using more of their financial aid on textbooks than their university counterparts. Keeping textbook prices artificially high is not a sustainable revenue source for the general fund. Our campuses are an ecosystem and we all need to work together toward the shared goal of student success. A thriving campus store is part of the community, and students need affordable access to their course materials. Bookstore managers are essential partners in figuring out how to balance these needs. This research estimates course materials costs for three of Oregon’s transfer degree programs: Associate of Arts Oregon Transfer (AAOT), Associate of Science (AS), and Associate of Science Oregon Transfer-Business (ASOT-BUS). The course requirements for each of the transfer degree programs are specified in the course catalog for each college. We collected the requirements and identified the courses that could meet each requirement. While there are some specific courses required for each degree, there are many possible ways to meet the requirements for disciplinary studies and electives. Therefore, where there were multiple options to meet a requirement, the course with the highest enrollment at that college was selected to fulfill that requirement. Data on course enrollments for each college was provided by the Office of Research and Data of the Oregon Higher Education Coordinating Commission from the most recent year available, 2015 (for the 2015 study, the most recent enrollment data available was from 2013). This research does not suggest a pathway that any individual would take, but rather looks at the courses that students collectively take most often at each college. This is where cost reductions can have the greatest impact. The next step was to visit each college bookstore’s website and look up the required course materials for each of the courses for the current term. If multiple sections of the course were being taught, the first one on the list was selected. This arbitrary choice accounts for the fact that students often are not able to choose their courses based on course materials cost because of competing priorities such as work schedules or childcare. For each course, the most and least expensive options for the total cost of materials was recorded. If one book could be used for more than one course in a series, its cost was only counted once. Where the bookstore provided price comparisons with external retailers, those options were considered when selecting the lowest cost. The research method described so far was conducted in 2015 and repeated in 2017 in order to make an apples-to-apples comparison. In addition to that, one more layer of analysis was added. In 2015 Oregon passed HB 2871, which requires all public colleges and universities to designate no-cost and low-cost courses in the schedule. This policy assumes that students will make course selections based on the cost of materials where they can. Thirteen out of the 17 colleges had implemented the schedule designation by Fall 2017, so for the 2017 study one more step was added: using the schedule to find the AAOT degree pathway with the lowest possible materials cost (this is the degree that is offered consistently by all 17 colleges). Again, this is not a program that any individual would pursue, but demonstrates the significant cost savings that are possible when faculty make changes in course material selection with cost in mind. In 2017, average costs at almost every Oregon community college are under the College Board benchmark of $2,840, a change from 2015 when some colleges were on par or above the national average. The statewide average cost of materials for a 2-year AAOT degree is $1,810.26. This comparison to College Board data is not apples-to-apples because the two figures are derived from different methods, but the national data provides a useful point of reference and shows that Oregon’s efforts to lower course materials costs in the colleges are having a real impact for students. The data supporting the charts below can be found in the 2017 Aggregate Statewide Data spreadsheet. Data for each college is available in the appendix (available in the full report), and the course/bookstore data for each college is available upon request. ASOT-BUS cost has fallen by $359.95, or 16%. 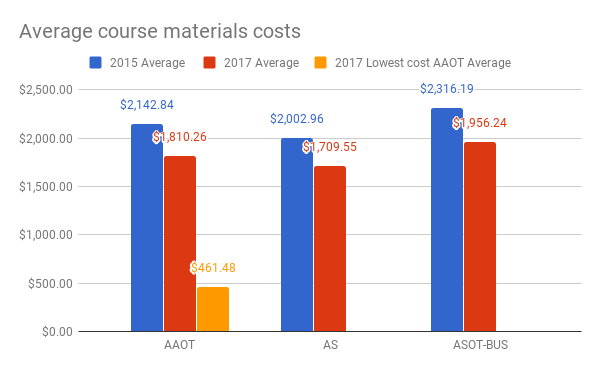 Assuming maximum flexibility to select courses based on materials cost, the average lowest cost AAOT degree pathway represents a savings of $1,348.78 from 2017 costs, or 75%. This is an extraordinary savings that demonstrates not only the tremendous impact of faculty choices but also the importance of prominently designating courses in the class schedule to make the savings information readily available to students. Figure 1, below, shows the statewide average cost of materials for AAOT, AS, and ASOT-BUS degrees (averaging the high and low materials costs for the degree). 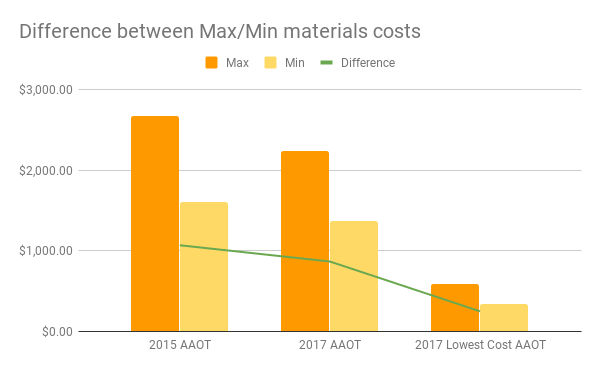 The blue bars show the average cost in 2015, the red bars show the average cost in 2017, and the yellow bar shows the lowest possible cost pathway through the AAOT degree requirements. According to the Oregon Community Colleges Data Mart, 3,464 students completed AAOT degrees in 2016-2017 (the most recent year available). An average savings of $332.58 from 2015 costs adds up to a statewide estimated savings of $1,152,057.12 for the students that completed their AAOT degree last year. If they were all able to pursue the lowest-cost degree pathway, those graduates would see an additional savings of $4,672,173.92. Of course, many more students take core degree courses than earn a degree in any year. Table 1, below, shows the student savings in 2017 based on average materials costs and headcount enrollment in the 10 highest-enrolled courses. These numbers show that while materials costs for writing courses are generally low, the courses are so highly enrolled that the potential savings is great. The data also demonstrate that immediate savings can be found by ensuring that courses in sequence, such as MTH 111 and MTH 112, use the same textbook, lowering the effective course materials cost of subsequent courses in the series to zero. Oregon’s college students saved nearly $2 million in these 10 high-enrollment courses alone compared to 2015 costs, and the potential future savings, as more faculty make the change to OER and lower-cost materials, is nearly $7 million. Figure 2 considers in more detail the difference between the maximum and minimum materials costs for the AAOT. The orange bars are the maximum (retail) cost of materials, and the yellow bars are the minimum that a student might pay for materials at the bookstore through rentals, used materials, required only, etc. The green line shows the difference between the maximum and minimum costs. This data highlights the efforts of bookstore managers to keep textbook prices down through negotiations with publishers as well as used book, digital, and rental options. In 2015, on average, the difference between the maximum and minimum price at the bookstore was $1,070.74 – a significant savings for the savvy shopper. In 2017, on average, the difference has narrowed to $868.89 – still a significant savings, but a drop of $201.85, or 19%. With maximum prices lower to begin with, the savings to be found have shrunk. In 2017, the difference between the maximum and minimum lowest-cost AAOT pathway is just $250.59. For community college students every dollar counts, yet these figures demonstrate that as overall prices come down, traditional savings tactics may become less relevant. It is also illustrative to calculate the number of hours it would take at minimum wage to pay for average materials costs at each college. Note that not all community college students earn minimum wage, and that Idaho, Washington, and California students work in their home states but take courses at Oregon community colleges (sometimes paying out-of-state tuition as well). When the benchmark study was conducted in 2015, the statewide minimum wage was $9.25/hr. Beginning July 1, 2016, Oregon’s minimum wage is set to increase each year, and additionally there are different rates for the Portland Metro area and nonurban counties (more information on this at Oregon Minimum Wage Rate Summary); this analysis takes into account these changes. Figure 3, below, shows the number of hours it would take at the respective minimum wage to earn the average cost of materials for AAOT, AS, and ASOT-BUS degrees (averaging the high and low materials costs for the degree). The blue bars show the average number of hours in 2015, the red bars show the average number of hours in 2017, and the yellow bar shows the number of hours for the lowest possible cost pathway through the AAOT degree requirements. The average lowest-cost AAOT degree pathway represents a time savings of 130.27 hours from the 2017 estimate, or 75%. 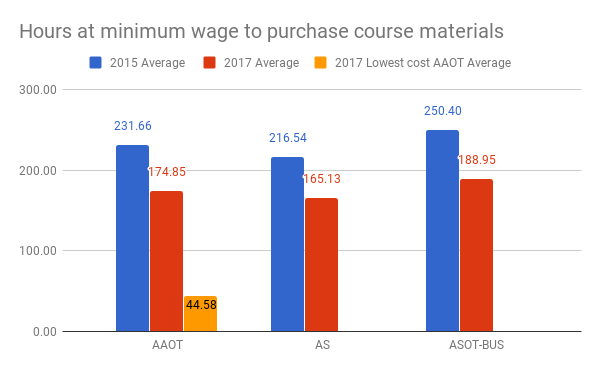 Figure 3: How many hours at minimum wage to buy course materials for AAOT, AS, and ASOT-BUS degrees in 2015, 2017, and lowest cost AAOT in 2017? Last, it is possible to compare the cost of course materials with the cost of tuition. Because community college tuition is relatively low, course materials costs represent a larger proportion of the total cost of a degree than they do at a four-year college or university. That said, tuition at almost every college in Oregon has gone up since the 2015 study was completed. The data shows that rising tuition costs can be offset by course materials savings. This finding suggests that tuition increases may be more palatable for students if administrators put real support behind textbook affordability initiatives to find the savings elsewhere. 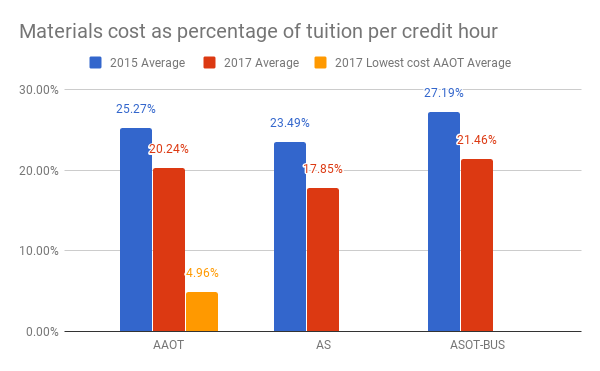 The average lowest cost AAOT degree pathway cost as percentage of tuition has fallen by 15.3 points from 2017, or 76%. The 2015 study established that Oregon community colleges, on average, were slightly below the College Board’s national estimate for course materials. That study concluded that it would be possible to reduce costs by 10% in the following biennium. The present study demonstrates that statewide, Oregon’s average materials cost is well under the national estimate. Of even greater local relevance, compared with the 2015 benchmark, statewide average materials costs for transfer degrees have fallen by 16%. Where no-cost and low-cost course materials information is available in the course schedule, the lowest-cost degree pathway offers an unexpectedly huge potential savings of 75% over the 2017 average materials cost. Having this data on a very local level offers insights into why course materials costs are often correlated with other student success metrics. When we know that buying textbooks is like paying tuition for an entire extra course each quarter, we have a potential explanation for why these costs have an impact on retention and time to degree. Translating the savings into fewer work hours and a lower percentage of cost per credit hour shows how affordable course materials truly lower obstacles to student success. The lowest-cost degree pathway data offers exciting directions for new research, not available when the first study was undertaken. Analyzing the schedule with this lens shows which courses can be redesigned around no-cost or low-cost materials for the highest immediate impact on student spending from a degree perspective. For colleges that are still working on their implementation, the data in this study shows why the course designation is high impact and worth prioritizing. Oregon’s community colleges are doing high-profile work to reduce costs for students. More and more faculty are taking the time to thoughtfully redesign their courses around no-cost and low-cost materials, with and without the help of grant money and other incentives. Oregon is already having a significant impact on the cost of college; in the coming biennium we can stay on track and continue lowering costs, especially for high-enrollment courses.